BEIJING — South Korea’s Ambassador to the U.S. says he is hopeful that a second meeting between President Donald Trump and North Korean leader Kim Jong Un will take place. 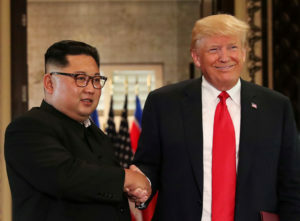 Left: South Korea's Ambassador to the U.S. says he is hopeful that a second meeting between President Donald Trump and North Korean leader Kim Jong Un will take place. Photo By Jonathan Ernst/Reuters.